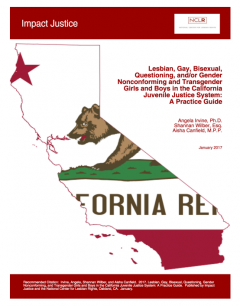 Impact Justice and the National Center for Lesbian Rights developed a practice guide to support California probation departments in meeting their obligation to promote the safety and well-being of lesbian, gay, bisexual, questioning, and/or gender nonconforming and transgender (LGBQ/GNCT) youth in their care and custody. The guide summarizes research showing LGBQ/GNCT youth are significantly over-represented in the state’s juvenile justice system, and are at higher risk than their peers for a host of negative outcomes. Based on these findings and emerging legal and professional standards, the guide recommends policies and procedures to prohibit discrimination, prevent harm, and promote fair and equitable treatment of LGBQ/GNCT youth in the state’s juvenile justice system. Angela Irvine, Ph.D., Shannan Wilber, Esq., Aisha Canfield, M.P.P.